Australia’s breakthroughs in life-changing medicine including medical devices, vaccines and cell therapies are set to accelerate with a new facility that combines technology, research and medical science. Dr Gordon McPhee: The translational phase is something that’s often referred to as the “Valley of Death” for potential medical treatment. 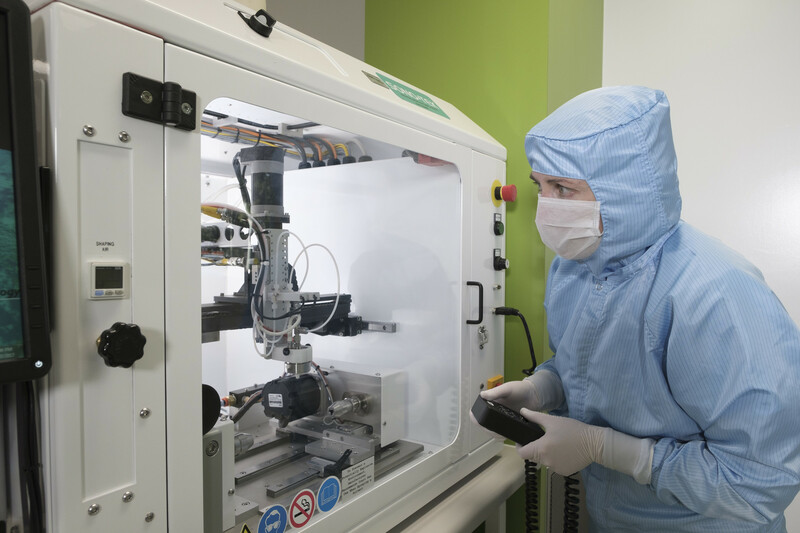 It’s where you are in a research environment, you have promising results that you need to trial in humans, in phase one clinical trials in humans and that step has traditionally been very expensive, with clean room space being very limited. Dr Michael De Veer: And that’s where Monash MedTech comes in, definitely. Dr David Haylock: As a collective it really does provide all the things that a small manufacturing enterprise would need to develop products in the medtech sort of sector. The BMTF is CSIRO’s key contribution. Our people have great capabilities. So, apart from the infrastructure we have people with extensive expertise in polymers, surface coating technology, biofabrication and biocompatibility testing. Dr Michael De Veer: Imaging is great. Everyone knows seeing is believing. Probably the most exciting new piece of equipment we’ve got is the new PET MRI that SIEF funded, which is right next to us. That’s a great piece of kit. Simultaneous PET and MRI. So, we can really image for a long time and get very high-resolution PET images as well as those really beautiful, high resolution MRI images. We really can go from that pre-clinical model and scale right up to human imaging. So, we sort of offer that full suite of imaging. Dr Gordon McPhee: We are a translational hub. We like to take advanced research to the clinic. We have a rather unique assortment of equipment within the cell therapies platform here all housed in an ISO 8 certified facility. One of them is the Biospherix ex-vivo GMP isolator for biological processing and expansion of cell therapy products. Dr Michael De Veer: Behind the scenes there we’re all working together, pulling together to give the company the best output. So, they get all of our intellectual input but realistically without having to separately engage with us all. Dr David Haylock: All of that capability is very expensive typically and often out of the scope of small manufacturing enterprises. Well we offer that sort of enormous infrastructure, very important infrastructure so they can develop prototypes and enable them to take the next step in product development. M2 has been created by CSIRO, Monash University and Monash Health Translation Precinct (MHTP). The new ‘one stop shop’ will bring the best minds and technology together to turn great ideas into a reality for Australia’s flourishing medtech industry and benefit millions of patients as a result of the breakthroughs expected. Minister for Industry, Innovation and Science Senator Arthur Sinodinos , today officially launched the M2 precinct at CSIRO’s new Biomedical Materials Translation Facility (BMTF) in Clayton, Victoria. “From life-changing cochlear implants, to life-saving vaccines, world-first 3D printed bone and tissue replacements, Australia has an incredible track record when it comes to medical technologies and pharmaceuticals,” Senator Sinodinos said. Australia is home to more than 500 companies working in the Medical Technologies and Pharmaceuticals (MTP) sector. Many of these are small and medium enterprises, which can struggle to make the expensive, time consuming transition from prototype to clinically tested product. M2 closes this gap for Australian businesses, providing a research ecosystem to transition new discoveries from the bench to prototyping, pre-clinical testing, industry evaluation and commercialisation. “M2 leverages some of Australia’s best medtech expertise, experience and equipment,” CSIRO Director of Manufacturing Dr Keith McLean said. With global populations ageing and emerging markets seeking better health care, there’s huge growth underway in the MTP sector. It’s expected to be worth almost $3 trillion by 2025, while $18 billion and 28,000 new jobs could be added to the Australian economy over the next eight years. “Monash is determined to help build a new, globally competitive biomedical industry with our partners,” Monash University Provost and Senior Vice-President Professor Marc Parlange said. This infrastructure is supported by the Science and Industry Endowment Fund .